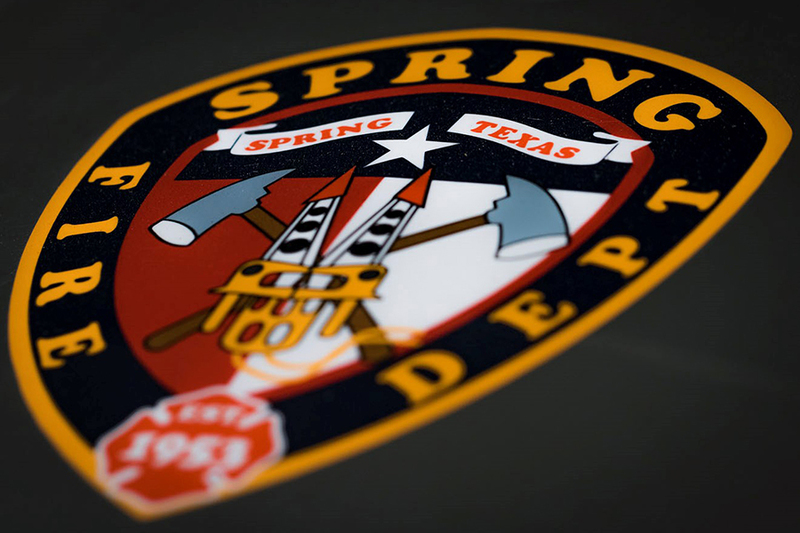 The Spring Fire Department, founded in 1953, is located in Spring, Texas, approximately 25 miles north of Downtown Houston in the northern portion of unincorporated Harris County. It is one of the largest combination fire departments in Harris County and the State of Texas. On April 29,1953, Spring Volunteer Fire Association, Inc. received its Charter. The fire department was formed and had a Fire Chief and 24 members. Station 71 was relocated to Old Town Spring. Station 72 was built at the entrance of the Northampton subdivision. New station built near the Birnamwood subdivision, eventually became Station 73 after the original Station 73 was provided to the newly formed Ponderosa Volunteer Fire Department. Built Station 74 on Old Aldine Westfield Road. at a rate of 3 cents per $100 valuation. This meant a $100,000 homeowner would pay $30 per year for Fire Protection. Michael F. West gave his life while fighting a 2 alarm commercial fire just outside of Old Town Spring. 911 became the phone number to dial for emergencies in Harris County. Mike Wisby was elected Fire Chief. Opened Station 75 on FM 2920 at Falvel Road. Alan Lankford was elected Fire Chief. The first full-time employee was hired to fill the role of Administrative Coordinator. There have only been three Administrative Coordinators since the position was created. 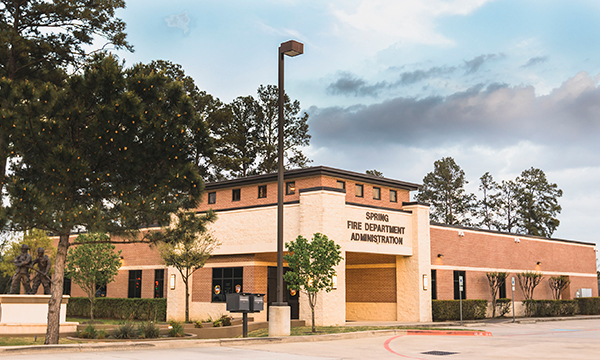 and is located at Spring Fire Department Administration. Harris County Emergency Services District #7 was formed. The first part-time firefighters were hired which changed us from a volunteer department to a combination fire department. The fire department began providing EMS First Responders to assist Cypress Creek EMS. Station 73 was relocated and opened. John Duarte was elected Fire Chief. Relocated and opened Station 72 on Northcrest Drive. Leased 14 brand new fire trucks; 7 Quints (fire engines with aerial ladders) 2 Rescue trucks, 2 Tanker trucks, and 3 Grass fire trucks for $8 million. Began Length of Service Awards Program (LOSAP) for volunteer retirement. 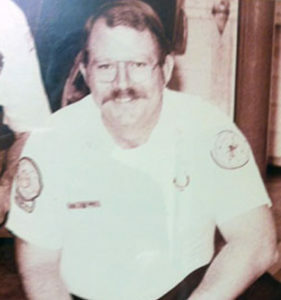 Stephen Sharp was appointed and then elected Fire Chief. Glenn Hastings was promoted to Fire Chief. All Officer positions were appointed by Fire Chief or his designees. Alan Lankford was appointed Fire Chief. Station 76 was opened at the entrance to the Londonderry subdivision. The Woodlands Township annexed a ~9 square mile area of our northwestern territory resulting in our area served to be reduced to ~62 square miles. Received one new Fire Engine. Received three new fire engines. ExxonMobil chose to move their campus into the Springwoods Village development. Operating budget was $1.7 million. Volunteers began staffing certain fire stations to ensure better response times. Opened new Administration building and Station 71. Eric Anderson was appointed Fire Chief. Operating budget was $2.1 million. Opened new Station 77 on Cypresswood Drive. Three part-time Deputy Chiefs were appointed. Resolution from Senator Dan Patrick. Hired our first 8 full-time firefighters. Station 73 was remodeled to accommodate full-time firefighters. Hired 16 additional full-time firefighters to enhance our coverage. ExxonMobil began moving ~10,000 employees into new complex. Our operating budget was $7.1 million. Hired our first Shift Commanders. SVFA Board of Directors positions were filled by the Executive Command Staff. Relocated new Station 8 from Old Town Spring to Booker Road. Scott Seifert was appointed Fire Chief. Robert Logan was appointed Assistant Fire Chief. Shannon Stryk was appointed to Deputy Chief of Training. Began sharing Ponderosa Fire Department Station 62 while Spring Station 75 was being rebuilt. Promoted our first full-time Captains. Opened Station 70 in Springwoods Village. Began remodel of Station 76 to accommodate full-time firefighters. Received two new fire engines and one new Tower truck. Purchased two new four-wheel High Water vehicles. Purchased one new evacuation boat and one new rescue boat. Hired full-time Facilities manager, Payroll and Benefits Administrator, and IT Manager. Operating budget was $11 million. Appointed Joel Crenshaw to the Deputy Chief of Training. Spring Fire Department Honor Guard was formed. Replaced LOSAP program with a Volunteer Retirement Program through TESRS. Purchased new training tower and it is located at Station 78. Operating budget is $13.7 million. Promoted our first full-time Apparatus Operators. Purchased two new six-wheel High Water vehicles. Began construction on new Station 74. Opening new Station 75 on FM 2920. Hired a Communications Director for the role of Public Relations, Marketing, Social Media, and Recruitment. Received a new evacuation boat and one rescue boat. Will receive one new aerial fire truck. Purchased a Chevrolet Suburban for Shift Commanders. Build Station 79 (if required). Move full-time and possibly part-time firefighters to TCDRS retirement program, staff stations with full-time, part-time and volunteers at Stations 74, 77, 78 and 79 as funds become available. Continue to recruit new volunteer firefighters, continue to train our personnel to the highest standards, continue to reduce response times and increase customer satisfaction. Our history of service continues and grows every day.